Another day and another part of our top 30 players in the NBA list. As we pass the halfway mark, we start getting down to some interesting picks, that you may or may not agree with. Either way, take a look at who we chose for numbers 16 – 20. And, just in case you haven’t been keeping up, here are picks 1-5, 6-10 and 11-15. It would certainly not be a crime to claim that at times Westbrook looks like he is the best point guard in the league. He is neck and neck with Derrick Rose as the most athletic point man in the NBA and like Rose, Westbrook understands how to turn this talent into strong play. Westbrook is an incredible scorer and a solid defender, and the one thing holding him back from being higher on the list is his occasionally troubling playmaking abilities. With the recent additions of Dwight Howard and Steve Nash to the Los Angeles Lakers, if the Thunder have any chance of making the NBA finals Westbrook will have to step up his play another notch, and in the process climb up into the top 10 of this list. Aldridge has been one of the steadier bigs in the league for a long time now. His abilities came to attention after Brandon Roy went down with his string of career-threatening injuries. Despite being on a Blazers team that has gradually declined following the departure of Roy, Aldridge has put up strong statistics, flirting with averaging a 20/10. Years earlier, Aldridge was compared to Chris Bosh and it would appear that he has now exceeded that comparison. Aldridge is an offensive nightmare to guard as his combination of competent jumpshooting and moves near the basket leave opposing power fowards in the dust. The sheer fact that the OKC Thunder feature three players in the top twenty is a testament to how good they truly are. Some consider Harden a better player than Westbrook, and while I don’t agree with that I still cannot push him any lower than number eighteen. Harden has talent bursting at the seams, and his 6th man role is in no way indicative of what he can really do. Considering that he is the 2012 NBA Sixth Man of The Year, that means a lot. Do not be surprised to see Harden continue to improve and be a top 5 shooting guard in the years to come. Josh Smith is one guy in the NBA that really should be rated higher. Very few swingmen are a versatile as J-Smoove and Smith’s two-way game and statistics prove that. He may not be the greatest of jump shooters, but Smith puts up consistent rebounding and defensive stats and considering that his offensive numbers are no embarrassment and one would have to think that he would at least make a few all-star teams. Unfortunately for him and the Hawks, he hasn’t received nearly the accolades he deserves, but here at WGTC I decided that he would be recognized for his talent by placing him at #19. A player with a similar skillset to LeBron cannot be overlooked, and while offensively Smith is light years behind James, defensively he is right up there with LeBron as he knows exactly how to use his athleticism running down fast breaks and swatting shots. 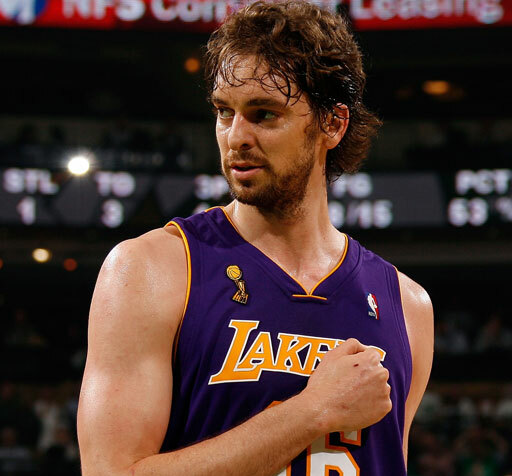 Remove one bad shortened season, and Pau Gasol is one of the elite bigs around the league. At 32, I refuse to believe that Gasol has regressed to the levels that his statistics have shown, and I truly do believe that he will have a bounce back season in 2012-2013. Andrew Bynum may have been the source of Gasol’s drop in stats, but I feel that the Lakers as a team did a bad job of integrating a very talented Gasol into the line-up. Team Spain’s play at the Olympics has shown that Gasol can easily be the alpha male of a basketball team, and with his level of talent I don’t see how that would be any different in the NBA. How Gasol plays in the future will be greatly predicated by Dwight Howard‘s move to the Lakers, but I feel that it will improve Gasol’s game as he has always been a better offensive than defensive player. Having a defensive player of the year anchoring the post will allow Gasol to focus on his offense and once again be an elite big man in the NBA. You know the drill, with 16-20 complete, we are nearing the end of the top 30. Let me know what you think of the top 20 in the comments below.